Most travellers to Tanzania come to conquer Kilimanjaro or to witness the spectacular wildlife. But after the safari, most take some time out to relax on Zanzibar. Jeremy Jowell spent several days in a hammock. There's a full moon above as I walk down the darkened beach of Nungwi at low tide. On the horizon, a thin blue line breaks the blackness, heralding the coming of dawn. Sleepy fishermen start emerging from their huts to brush their teeth. Others stand with hands clasped in prayer. 'Jambo .. habari,' one man greets me warmly, flashing a Zanzibari smile.Kombo Mbwana is using the spring low tide to make repairs to his dhow. 'Life here in Nungwi is simple but it's hard,' says Kombo. 'To fix our boats, we have to use a paste made from ground-up animal bones mixed with oil. It seals the holes and also treats rotten keels. Then no water can get in ... and our boats can last many years. 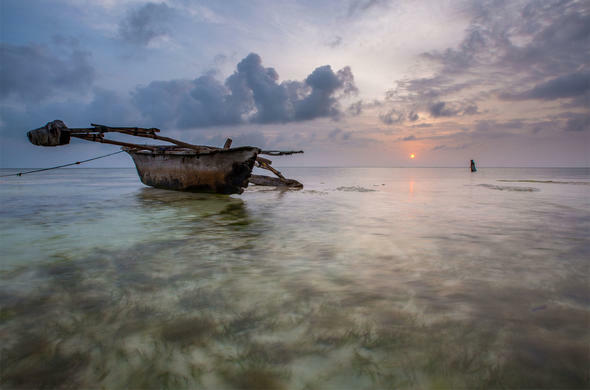 'For these hardy fishermen on the northern tip of Zanzibar, life is very different to the existence of their friends in Stone Town. Situated on the western side of the island, Stone Town is the centre of all trade and transport on Zanzibar. It's also the most mythical must-see destination on the East African coast.I've just arrived on Zanzibar and thick dark clouds are building up as I speed into town on a 'dalla dalla'. My first sight of the labyrinthine alleyways of Stone Town leaves an indelible impression. Thick drops of rain spit down as I stand and watch black-veiled women hurry along the snaking narrow streets.Muslim men skin sugar cane and sweat in the humid heat. In a darkened recess, small children recite verses from the Qoran. I enter the maze of old yellow buildings with their intricately carved wooden doors. Mosques tower above the crumbling city and I walk around mesmerised, lost in the Stone Town world. Normally I find my way easily around any large city but here I'm literally walking around in circles.With all the curio shops and handicrafts, shopping is a favourite pastime for tourists. But for a successful spending spree, there's one vital rule to learn: If you discover an interesting shop, go inside immediately, because chances are you'll never find the same place again. In no time at all, I've lost my sense of direction but luckily I meet Mohammed, local tour guide and clever con artist, who guides me to my destination. 'Hakuna matata ... no problem,' he smiles. 'Maybe in three days time, you know your way around. 'After sundowners at Africa House, locals and travellers alike all congregate at Forodhani Gardens for the evening feast. Row upon row of meat and chicken kebabs, along with mounds of kingfish, calamari, marlin, tuna, prawns, lobster and squid, are barbecued on the coals. With good reason, it's billed as the biggest seafood buffet in the world. Smiling stall owners use archaic contraptions to squeeze out sugar cane juice, grinding the shoots to a pulp.After several heaped plates of rice and tasty marlin, I make another futile attempt to find my way across town back to my guest house. But fifteen minutes later, I'm back where I began. It's time to beat the Stone Town heat and head off north to Nungwi. The cramped minibus battles through twisting alleyways and soon we're driving alongside palm trees and a turquoise sea.Two hours and eight obligatory police checks later, we arrive at the northern tip of the island. Nungwi is a laid back oasis of lazy days and tropical delights. Coral reefs ring the palm-fringed shore with small sets of bungalows dotted along the beach. Some people come to Nungwi for a day and stay a week.Others lose themselves for months in the pure pleasure of the place. For many travellers, an extended stay in Nungwi means party time in paradise. In recent years, this idyllic haven has transformed from a quiet fishing village into a backpackers dream. 'You know, eight years ago there was nothing here except my tent,' says Cholo, the Eddie Murphy look-a-like who owns a beach bar and restaurant. 'Then all these guest houses got built and the travellers started arriving. But even though so many people come to Nungwi now, we still have a good time here,' he smiles, swinging into a hammock.Next morning, I'm up at sunrise, walking along the beach. The fishermen have just returned from a night on the ocean and I help the tired crew drag their dhow onto dry sand. The weather-beaten captain approaches me with a broad smile and shakes me firmly by the hand. 'Asante sana .. asante sana,' he thanks me warmly. 'Karibu ... my pleasure,' I reply. It's just a ten minute walk along the beach from my bungalow but here it's another world.The morning sun bathes beached dhows in a soft yellow light as everyone begins their daily task. Mending nets, cleaning boats, collecting shellfish from the exposed sandbanks. Nungwi is the major dhow-building centre of Zanzibar and the men are hard at work bashing their boats into shape.Five minutes further on and well worth a visit is the Mnarani Aquarium, an education centre that houses several hawksbill and green turtles. These endangered species can often be seen in February coming onto the beaches of Nungwi to lay their eggs.The Nungwi noon sun beats down relentless. I take shelter in a hammock at Cholo's and consume a delicious lunch of pasta and octopus sauce with garlic bread. Later on the lazy afternoon, I force myself to stir and take a snorkelling cruise to Kendwa Reef. Last night was full moon and with the spring tide, the visibility underwater is not great. But that doesn't seem to matter on such a glorious day.My favourite time is sunset, when the fishermen launch their boats and set sail towards the perfect red globe slipping slowly below the horizon. The receding tide laps gently on the shore as dhows drift silently by. The air is still, the water calm, the mood relaxed.Days in Nungwi are spent lying on the beach, snacking on seafood and catching up on sleep. But for the sporty type, there's a lot more action offshore. The turquoise ocean, particularly stunning around the famed Mnemba Island, is blessed with spectacular coral reefs which offer the underwater enthusiast some of the best diving along the East African coast.I join a full day snorkelling trip to the Mnemba Atoll where I'm astounded by the clarity of the vivid waters and abundance of marine life. Even from the boat, I can clearly see multi-coloured fish swimming below. Slipping beneath the surface, I look into the depths and watch shadows of large surgeonfish and wrasse cruise along the reefs.My time in Nungwi drifts quickly by and soon it's my final day. As usual, I'm up before the dawn. Glinting through the palm trees, soft sunbeams wash the awakening village in a golden light. Smoke rises from breakfast fires and small sleepy children slowly walk to school. My taxi to Stone Town will shortly arrive and the sun-drenched days will soon be miles away.No more early morning walks to the fishing village or friendly chats to the dhow builders. Daily life just won't seem the same without lying for hours in a hammock. Copyright © 2002 Jeremy Jowell.